Stay tuned! More of Teresa's books coming to the UK, Australia, New Zealand and around the world in 2013! Julian Kane is back in town. 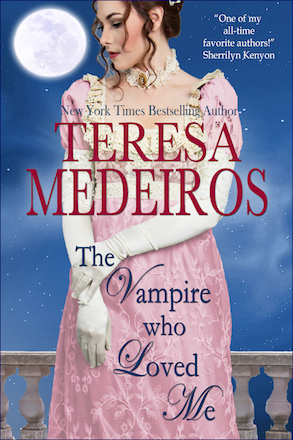 Once, as a girl of seventeen, beautiful, headstrong Portia Cabot saved the life of the dashing vampire Julian Kane—who marked her forever, then left to go in search of his soul. He returns five years later to find the enchanting young girl he left behind grown into a bewitching woman with a woman's heart...and a woman's desires. Portia quickly discovers that Julian's seductive and forbidden kiss can still make her crave the night...and his touch. But a recent spate of murders makes Portia fear that the man she has always adored may truly be a monster.